This is a design concept to tackle the environmental and ethical impacts of fashion. The low prices of fashion items encourages more impulse purchase which produces more waste in the environment. Consumer education and awareness is growing, but still slow. How can we help people to shop more consciously and raise awareness of fashion’s environmental impact? A mobile application concept to track what’s in a user’s current wardrobe. The goal is to help consumers make better purchase decisions in the future through reflection and education. This idea stemmed off a 2015 Semi Permanent x Telstra Innovation Lab. In the original Innovation Lab, the workshop was based from the Stanford d.School Lab Process focusing on four key phases: discovery of the problem space, definition of key problems, development of possible solutions and delivery of a solution. I decided to build on this solution by using the UX design process to produce a high fidelity prototype. The world now consumes a staggering 80 billion pieces of clothing each year. This is up 400% from two decades ago. Only 10% of the clothes people donate to charity or thrift stores get sold. My first step was to begin with research and delve deeper in the topic to identify user needs. Learn to what extent consumers consider the environmental and ethical impact of their clothing purchases. Do people care? Get an insight into how consumers currently gather information about the sustainable and ethical practices of clothing brands. Consumers who are not aware of what they’re buying and the impact it has on the environment. They buy with the intention of accessing a new fashion item cheaply. Conscious consumers who care about how and where their clothes are made but find it difficult to find out if a brand is ethical or sustainable. Survey: to determine influencing factors when purchasing clothing. Interviews: to find out in detail the purchase behaviour and process of the consumer. Awareness and education is the biggest issue. The ethical and sustainable impacts of purchasing clothes is the least important aspect in their decision process. When people do want to find out more, it often requires hours of research to find the right information about a brand. They don’t buy a lot of clothes, they like sales. Quality and price are important to them. Question: How important are these factors to you when you purchase clothing? Value is very important when purchasing clothing. Does the price and quality match? Females who purchase clothing and like to save money and buy less. They have a little knowledge on the environmental impact of fashion. This group focuses more on financial goals rather than sustainable goals. It struck me that one of the biggest problems was education and awareness about how cheap clothing affects the environment and other stakeholders in the manufacturing process. Michelle needs a way to track what’s in her current wardrobe and her future clothing purchases because she wants to save money by buying less items but better quality clothing. she will save money and reduce clothing wastage. Storyboard sketch based on pain point of not knowing what’s in your wardrobe. Storyboard sketch based on pain point of not knowing what the material and fabrics mean in terms of quality. Before sketching solutions, I decided to use the UCDC to help me capture all the important findings and information on one page. How might a mobile application help Michelle track the items in her wardrobe and educate her about the environmental aspects of her clothing purchases? A mobile application that lets users log and track their items in the closet. 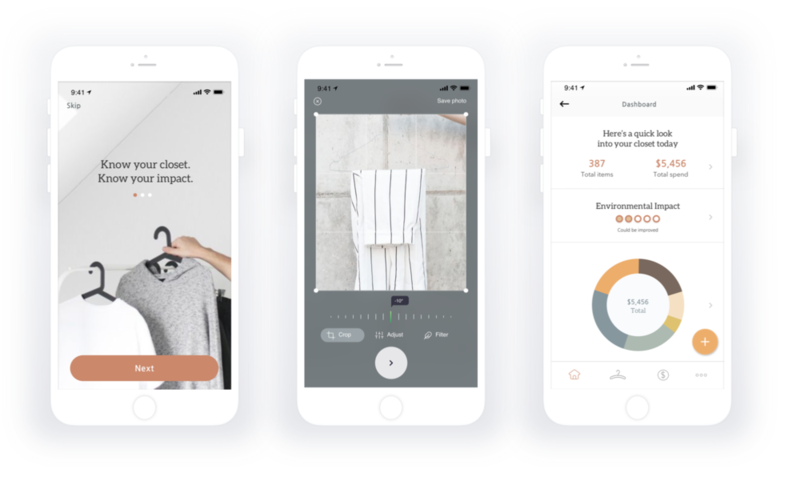 The application synthesises brand and fabric information to educate the user on the environmental impact of their wardrobe through a simple rating. 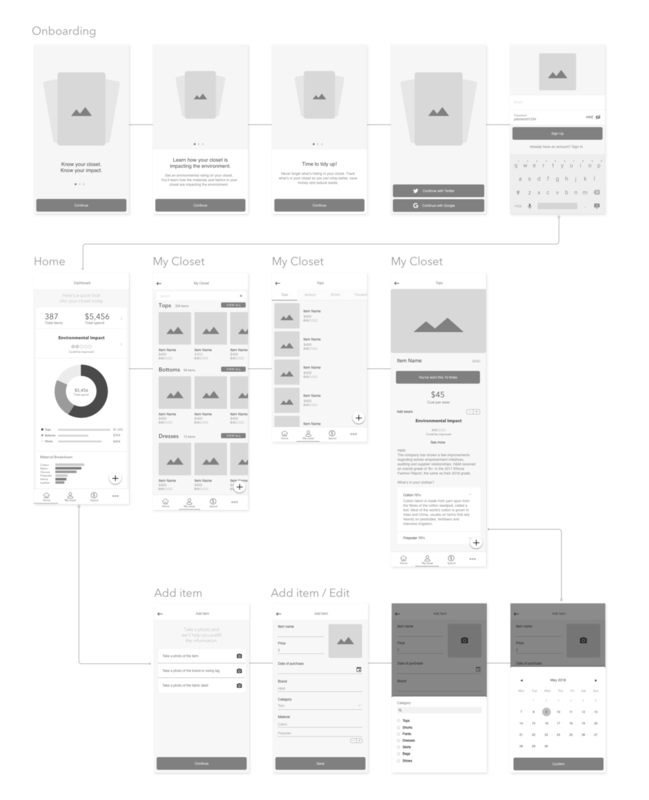 The dashboard hierarchy was a weakness in the first wireframe. In the ‘My closet’ screen, users made a note that there is no motive to click into the item more than once because there would be no new information shown after the first time they log the item. I introduced a two column grid to show ‘total items’ and ‘total spend’ on one line. This saved space and allowed me to push ‘Environmental impact’ up so that it is more prominent when the user opens the app and lands on the dashboard. I introduced a ‘cost per wear’ function so users can log how many times they’ve worn an item. This provides another level of analysis of a user’s wardrobe which encourages the user to return to the item screen whenever they wear the item again. This is the homepage of the mobile app which shows you a snapshot view of your closet including: number of items, total spend of your closet, an environmental impact rating, category and material breakdown. The user can click into any of the sections to get more detailed information. The goal of this is to provide a quick but important insight into a user’s closet to help them reflect on their purchase decisions. User goal: Save money, know what’s in your wardrobe. Learn about the clothes you own to help you make better decisions. Log how many times you’ve worn an item to calculate your cost per wear. Learn about the environmental impact of your clothes based on public brand information and material and fabric insights. Log items in your closet. To add an item in your closet, you will be prompted to take a photo of the item, the label and the swing tag. This will auto-generate information needed for the item report. The user can then edit or add information manually before saving the item to their closet. The user can also view all their items in the closet under the ‘My closet’ navigation tab. This is a concept that needs validation for feasability with the tech team. A discussion needs to be had on how can we integrate available data about the brands and material to auto-generate a report on the ‘items’ page. My next steps would involve more testing and user interviews to improve the usability and experience of the application. A search function that allows users to research a brand before they purchase. Bulk add function so new users can easily add multiple items in their wardrobe at a time to shorten upload time. Show alternate brands or fabrics that are more environmentally friendly. Education and resource function that can help users make more informed choices the next time they purchase clothing. Outfit or capsule wardrobe building function.